Not an unusual trait for a race horse, and it hasn't deterred her from being a champion. Not to worry, says her regular pilot, Hall of Fame member Mike Smith, who will be aboard the four-year-old daughter of Quality Road in Sunday's Grade I, Breeders' Cup “Win and You're In” Zenyatta Stakes for fillies and mares, three and up, at 1 1/16 miles. “It's part of her game,” Smith said of the balky bay, oddsmaker Jon White's 2-5 morning line favorite. “Sometimes she does that, depending on the pace. It's like if she knows the pace is quick enough, she'll sit back. If not, she likes to go up there. You have to be a little careful not to get in her way. “Abel Tasman can be a little bit temperamental, get a little bit mad, and then the next thing you know you have to put her where she needs to be instead of her taking you,” Smith continued. “It's just fun and games; it all depends on the pace. If they're going quick enough, she's fine. The Zenyatta, race five of nine: Shenandoah Queen, Tyler Baze, 6-1; Abel Tasman, Mike Smith, 2-5; La Force, Drayden Van Dyke, 4-1; Vale Dori, Joe Talamo, 5-1; Lemoona, Flavien Prat, 20-1; and Fool's Paradise, Mario Gutierrez, 30-1. 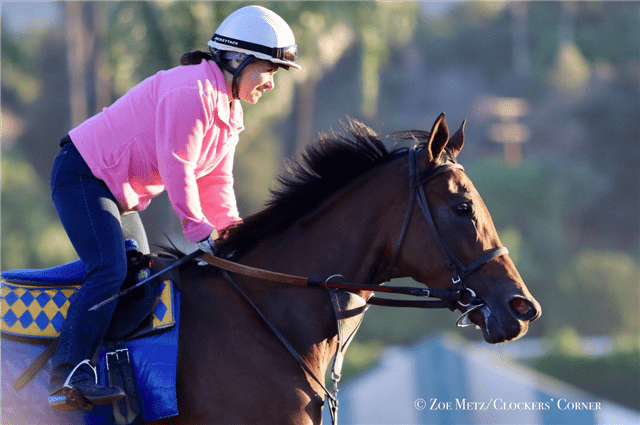 This entry was posted in Breeders' Cup and tagged Abel Tasman, Bob Baffert, Breeders' Cup, Breeders' Cup Distaff, mike smith, Quality Road, santa anita, santa anita park, zenyatta stakes by Ed Golden/Santa Anita. Bookmark the permalink.